არმანდო ენტონი "ჩიკ" კორია (ინგლ. Armando Anthony "Chick" Corea) (დ. 12 ივნისი, 1941, ჩელსი, მასაჩუსეტსი) — ამერიკელი ჯაზ პიანისტი, ვირტუოზი კლავიშისტი და კომპოზიტორი. მისი კომპოზიციებიდან ბევრი ჯაზის სტანდარტად არის აღიარებული. არის გრემის ჯილდოს არაერთგზის მფლობელი. 1960-იან წლებში იყო მაილს დეივისის ბენდის წევრი და მონაწილეობდა ელექტრონული ჯაზ ფიუჟენის მოძრაობის შექმნაში. Murph, John (December 2, 2004). Chick Corea Reaching for the Stars. BET Jazz. Talking to Les Tomkins in 1972. Jazz Professional. ↑ “Today in history“, ABC News, June 12, 2014. ↑ Yanow, Scott. 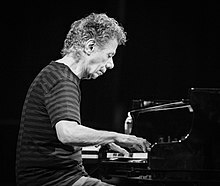 (June 12, 1941) Chick Corea. AllMusic. წაკითხვის თარიღი: July 1, 2011.
ეს გვერდი ბოლოს დარედაქტირდა: 22:57, 28 დეკემბერი 2018.